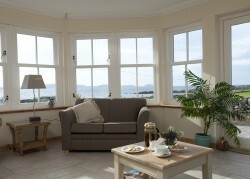 Luxury bed and breakfast accommodation is available at Ardoran House on Iona. A stylish, modern guest house with spacious well-appointed twin or double bedrooms, all with ensuite facilities and complementary toiletries. All Ardoran House’s 5 twin or double bedrooms have a luxury ensuite bathroom with walk-in shower, soft, fluffy towels, flat screen TV with Freesat, hairdryer, beverage tray, iPod docking station and free WiFi. Other features include a bright, airy conservatory with views over the Sound of Iona to Mull, large, comfy lounge, sauna and outdoor spa bath where you can sit and relax while taking in the spectacular view. Martyr’s Bay (formerly Finlay Ross) is a recently refurbished Bed and Breakfast on Iona, has eight well appointed bedrooms (some en suite) all with wash hand basins and tea/coffee making facilities. Facilities include TVs with FreeSat in bedrooms, Wi Fi is available and breakfast is Continental buffet style. Ardbeg self catering accommodation provides you with all the luxuries for modern living and is fully equipped for up to ten guests. Ardbeg is a purpose built large family home with five bedrooms, three of which have luxury en-suite bathrooms and two share a large family bathroom. The well appointed ground floor has one bedroom with ensuite shower, fully equipped kitchen, spacious lounge/diner and a compact conservatory. There is also a hot tub situated directly outside the house. 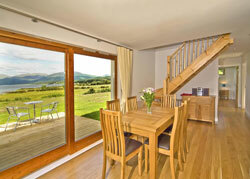 Seabank Lodge offers self catering accommodation near Oban for up to 8 people. Situated at Benderloch with views of Loch Creran, this traditional Highland design cottage has 4 bedrooms with contemporary furnishings and features a hot tub in the garden, disabled access, decking area and spacious private grounds. 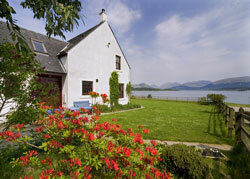 Seabank Farmhouse offers self catering farmhouse accommodation near Oban for up to 10 people. Situated in Benderloch near Seabank Lodge with magnificent sea loch and mountain views, this homely, shoreside farmhouse is 5 mins from the sandy beach at Tralee Bay and features 5 bedrooms, a large fully equipped fitted kitchen with open plan dining area and wood burning stove. The Isle of Mull is very popular with visitors who want to explore the island in search of the huge variety of wildlife on land and on sea. Visitors who want to see whales, dolphins, puffins and a whole lot more Hebridean wildlife take boat trips from Mull. Staffa Tours operate wildlife boat tours from Tobermory and Fionnphort and you may be looking for accommodation on Mull. 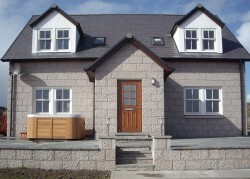 Isle of Mull Cottages provide self catering cottages on the Isle of Mull sleeping between 2-10 people. Short Breaks, Last Minute Offers and pet friendly cottages are also available. Island Holiday Cottages offer a huge selection of self-catering cottages, houses and cabins to let on the Isle of Mull and the west coast of Scotland.